Where we want to go, and how can we get there? 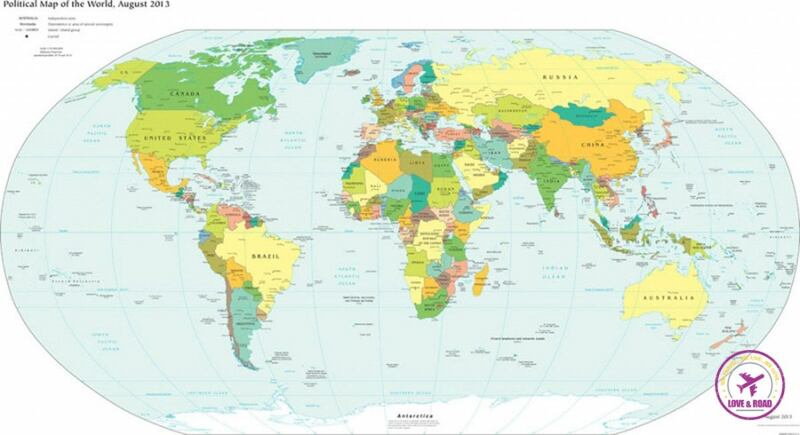 Have a close look to the world map. Look at it carefully! Do you know how many countries exist? On January 2013, ONU published that we have 193 countries spread in 6 continents. But the number can be higher if we consider places like Vatican and Palestine as an independent country. Based on this, do you have an idea how many cities we have around the world? And where we want to go? I presume it is not an easy question. Even Rob, my atlas man, was not able to answer that. The point is, If I don’t even know how many cities we have around the globe, how will I be able to pick one to live??? Or how can we make only one travel plan if there are so many places where we want to go?? Seriously, it’s a damn difficult choice!!! So we decided to pick places that we’ve never been before and different cultures we want to learn about. After some discussion we made our first decision: we will be going somewhere in Asia. Much easier now, we just had to choose between 50 countries. PHEW!!! Doing some research we found Chiang Mai, Thailand, and we felt in love with the city! Different culture, new possibilities and a place well-known for welcoming foreign travellers. Located in the north of Thailand, it seems to be a good base to travel around Asia and also a nice city to discover. The nature, festivals, food, everything looked so amazing that we set Chiang Mai as our destination. The idea was to have a place to stay for some months, travel around and prepare ourselves to become professional travellers. For that we checked the possibility of renting an apartment, visas, how to get around, shops, and read a lot about the city. Our dream was getting shaped, we had the date: April 2014, and a place to go: Chiang Mai. From a universe of more than 190 countries we figured out that Thailand would be our next home. And how to get there? I am not sure if you read it before, but we are budget travellers, which means that we can’t fly in a business class, neither spend money in luxurious hotels. But thanks to google search engine and travel websites, it is not that difficult to find good deals. There are several websites where you can search for flight tickets, and one that we use the most is www.skyscanner.com. There we can find flights around the world and check prices from diferents sellers. After checking in skyscanner we also go to the Air Company website to double check the fare. Sometimes you can find cheaper prices or promotions. To get to Chiang Mai we decided to make a stop around Europe: we discovered that it would be cheaper to buy two separate tickets than one trip only (ie: São Paulo – Amsterdam and Amsterdam – Bangkok). There are so many connections and possibilities that I recommend to create a spreadsheet and take notes of flights dates and prices. And don’t forget that the fares change every hour and day so, if you find the perfect one, book it! As we would be flying to Europe to make our connection, we could not miss the chance to catch up with some friends and visit some cities. And then the mess started again: we had to decide which places we should visit or where we would stay, but to make a travel itinerary sounded impossible . There was only one solution: hit the world with an open plan! — Relax, everything is gonna be alright, I promise you! It was a turning point, I truly believed him. Was I too nayve?? Maybe, but I’m sure he will not disappoint me. Thanks God we have friends and they are like angels. Rob sent an email to Grazi, his childhood friend that works at a travel agency, asking her if she could book a ticket for the same flight. Lucky us, it worked! Ten minutes later I received an email with the confirmation from Air China. Of Course we had to pay more, as the promotional seat had finished, but at least we were in the same flight. We didn’t have plans to get back to Brazil soon, but Grazi (thank you again for saving us from travel traps) advised us to buy return tickets. We were not going to use the tickets, but we should have them if the Immigration Authority asked for (and they did it). Definitely we throw some dollars in the bin, but I prefer to be in the safe side, rather than come back home soon. Even with all the changes we ended up saving some bucks (Air China flights were so much cheaper than others airline companies). Madrid was an excellent choice, we didn`t know the city yet and we would be close to Lisbon, Portugal, where we had some “business” to do. Doing our researcher we found that to make our life easier and to avoid paying tremendous taxes to Brazilian government (6,38% of every transaction abroad) we should open an international bank account. We found one bank in Portugal that allows international citizens to open a bank account e and use it to cash money all around the world. So after Madrid we would be going to Lisbon to open our first international bank account, What a fancy business appointment! At the end we changed our destination: instead of Thailand we picked the whole world, maybe hitting Chiang Mai on September 2014 or maybe not. Who knows?? The important thing was that we got a date: April 24th. The life changing day! The beginning of Love&Road! And every little thing gonna be alright, by Rob and Bob Marley. I am an organization freak as well..so, can totally relate. Its always so difficult to pin down on one particular place to visit next when the world is full of so many beautiful places, isn’t it? BTW, very nice tips on flight booking and stay arrangements in budget! And you know what, I’m way more relaxed now, I learned to live and travel more spontaneously.